The 50th anniversary of the Churches Together in Llanishen & District was celebrated with a Service of Thanksgiving and Witness which was held in Roath Park, at Pentecost. 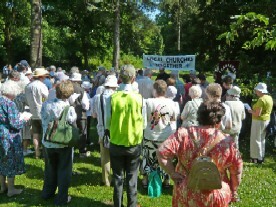 Members from a number of Churches met in the Wild Gardens and walked together down Lake Road West following a route we had been given by the police, and ending at the site which had been ‘roped off’ for us at the Southern end of the park. A banner was put up and a short Service was held, celebrating the coming of the Holy Spirit in power and inviting us all ‘to go out and bear fruit’. It was good to hear everyone singing together ”Walk Together in the Light of the Lord”. After the Service we stayed to enjoy fellowship together as we ate our picnics. Fortunately, the weather was good and it was a very happy afternoon.